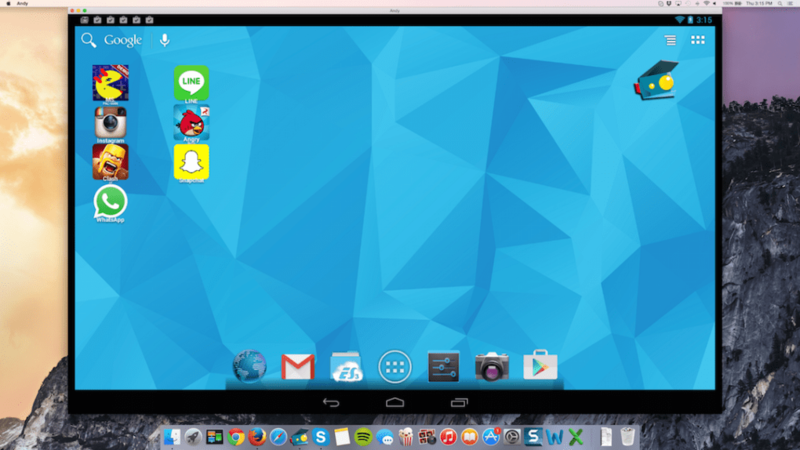 Want to run Android on a Mac? Andy OS allows you to do just that, emulating the complete Android experience on your desktop. Unlike BlueStacks, which is merely a launcher for Android applications, Andy OS gives you complete access to Google's operating system. 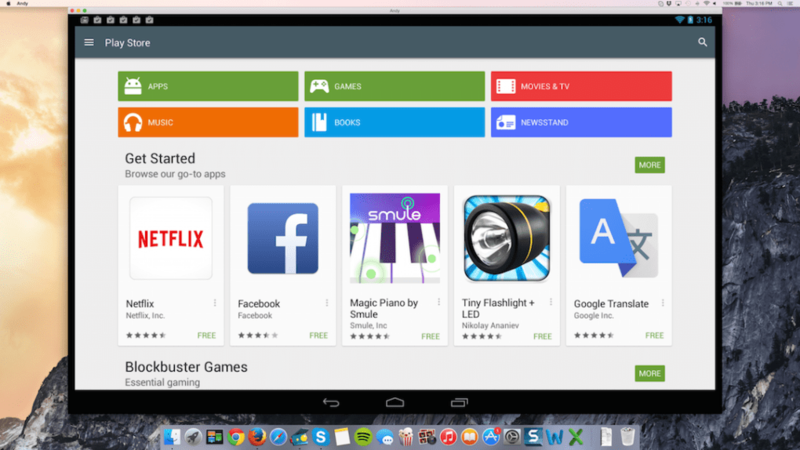 You can download and install apps and games through Google Play, or side-load APKs and run them through the Andy OS. This is particularly useful for using messaging apps like WhatsApp, Viber, or LINE from your desktop. But there's much more to Andy OS than just running apps: the software also supports notifications, widgets, file browsing (including access to the local file system), application data syncing, and full multi-touch gestures. Andy OS is great for mobile gaming, since it lets you use your phone or tablet as a remote control for the desktop emulator. This is handy for playing certain types of action games, or racing games, for example. At the time of writing, Andy OS runs Android Jelly Bean 4.2.2. While it's a shame it isn't pre-installed with the latest OS (KitKat 4.4), it's up to date enough that it should run most apps. 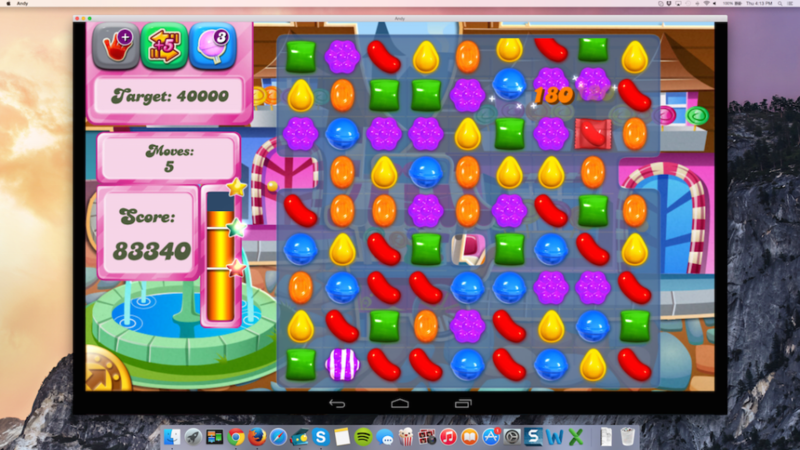 Andy OS isn't quite as simple to use as BlueStacks, in the sense that it requires a little bit more setup. That said, it's still very easy. Andy OS runs through VirtualBox virtual machine, which comes bundled with the installer. Once you've downloaded and installed the software, you simply run the application and go through the Android configuration options as you would on a first-run of a regular mobile device. I experienced the occasional glitch when running the application, although in general, it works pretty smoothly. Andy OS is great for 'power users' because it can be customized in a number of ways. For starters, you can change the way it runs in the virtual machine, allocating more RAM, for example, to make it run faster. But you can also root the Android operating system through Andy OS, allowing you more customization within the OS itself. If you want to install custom ROMs or change to a different launcher, you can. Andy OS is pretty simple to set up, highly customizable, and gives you a complete Android experience. If you just want to play popular casual games or run simple apps, BlueStacks is a more hassle-free solution. But if you want to properly emulate Android on Windows, call on Andy OS. 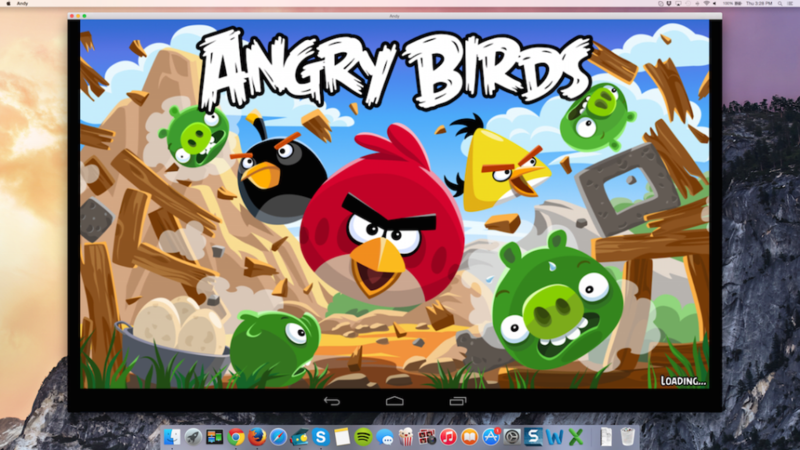 Run your Android apps directly from your Mac! Andy OS is the first full featured mobile operating system that runs on any Mac, and in the Cloud - it breaks the barrier between desktop and mobile computing, while keeping you up-to-date with the latest Android OS feature upgrades. It also provides users with unlimited storage capacity, Mac compatibility, and the freedom to run the most popular Android apps on a desktop. Thanks to seamless connection between desktop and mobile, you can receive a SnapChat phone picture on the street and see it on your desktop at home. Only Andy OS syncs to the users' Google play account through the cloud. This means that you don't lose app history between an app on your phone and the same app on your Mac. With Andy OS your devices are synced, so any app you run on Andy OS, you can run on your phone - and visa versa. What do you think about Andy OS? Do you recommend it? Why?